In the development phase of Broto: Art, Science & Collaboration, a new organization dedicated to art and science collaborations, we spent investigative time talking with artists and scientists about shared work. Very early on and very clearly, the concern about outcomes became an issue to manage, especially for the artists with experience in collaboration. Too often, they said, so-called collaborative projects focused on the artist producing a final result. Artists often end up documenting collaborations while feeling unfairly pressured. 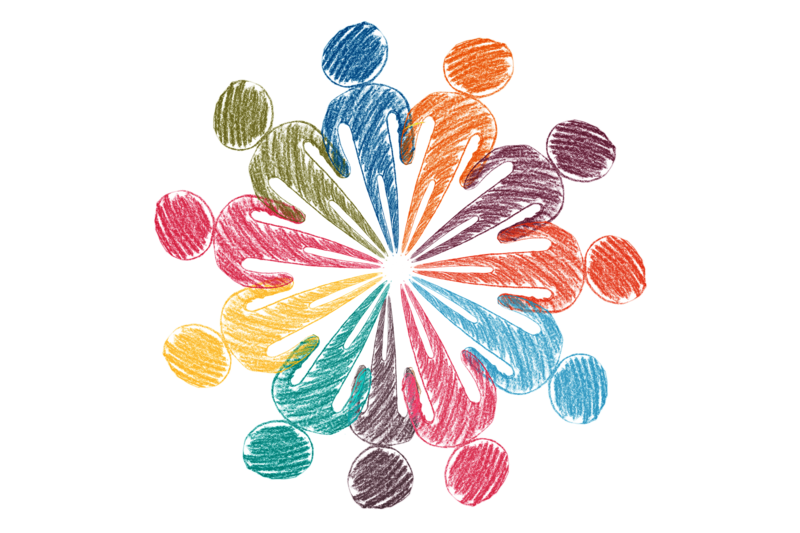 Without having even begun a collaborative process, how can we conceive a result? This is seen as a crimp in creativity. 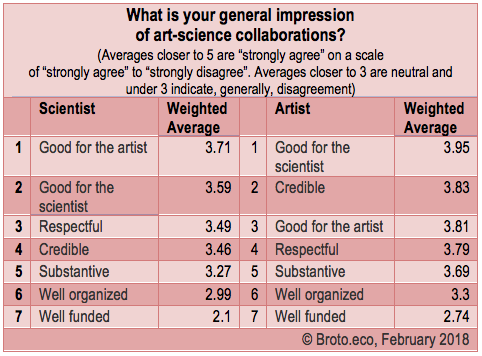 In Broto’s independent surveys, both professional artists and professional scientists are more concerned with the “scope of work” than any other measure used to describe art-science collaboration. “Outcome” despite being such a focus of discussion in our exploration, actually scored very low in importance for both artists and scientists. That burden of expectation most likely therefore comes from mainstream audiences, or some other stakeholder, and not their collaborators. In February 2018, Broto distributed cloned, online surveys to 100 professional artists and, separately, 100 professional scientists in the US and Canada. The goal of Broto’s independent market research is to assess degrees of agreement between the two populations as foundation work to understand art and science collaboration – the cornerstone of the Broto mission. On the whole, artists are statistically more optimistic about art-science collaborations than scientists and indicate a greater likelihood of doing collaboration than their science counterparts. Measuring against eight components of collaboration, the responding artists were, in every case, more enthusiastic than scientists about a potential collaboration. By comparison, scientists are still bullish on art-science collaboration, just less so or more neutral. This suggests common territory to forge future collaborations. “Scope of work” in the future collaboration project topped both lists, along with “chemistry with the collaborator” and level of “communication”. For both camps, good work and a good working relationship are keys to considering a future collaboration proposal. Having enough “time” to do the collaboration was fourth in both ranked lists. The lower-ranked factors on the lists show the most vivid difference. For instance, “funding” for a future collaboration project was a much more important factor in considering a collaboration for artists than scientists — perhaps a nod to the disparate incomes for the two groups. As noted previously, both artists and scientists scored “outcomes” at the bottom of their respective lists, strongly suggesting that it would be important to clarify misconceptions about a focus on “outcomes” to create a better environment for a true collaborative effort. Clearly, both artists and scientists put more emphasis on “framework” and substance than results – an issue that might well be discussed in a potential collaboration partnership. Again, the artists as a group were more statistically enthusiastic than their scientist counterparts. In every case, the artists were more agreeable than scientists to the statements tested. Notably, each group thought the equivalent partner in the collaboration benefitted most. Art-science collaborations are “good for the scientist” topped options in the artists’ list and art-science collaborations are “good for the artist” topped the scientists’ list. An additional key finding was the groups’ relative ranking of the statement “art-science collaborations are ‘credible’”. In a mismatch that might need management in a potential collaboration, artists think art-science collaborations are more credible than scientists do. Another highlight is the relative ranking of “substantive” in collaboration – ranking low among the options on both lists, but better than “well organized” or “well funded” which take the bottom of the lists. Both artists and scientists disagree with the statement that collaborations tend to be “well funded” — the scientists more pessimistic. 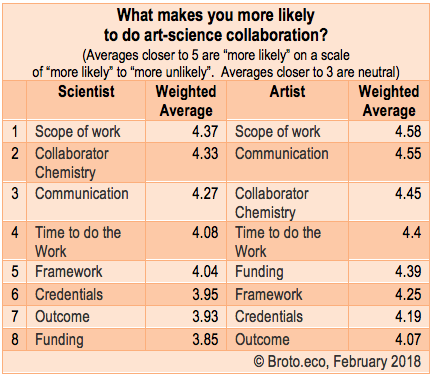 Overall, artists were more likely to have done an art-science collaboration than scientists. In both groups, the largest proportion of respondents were aware of collaboration, but had yet to do one. In the “Don’t know/Not interested” category, scientists expressed more ambivalence to art-science collaboration than artists, by a 2-to-1 ratio. However, a follow up question with respondents already experienced in collaboration shows higher opinion of collaborations. Scientists who indicated previous experience with one or more art-science collaborations were very enthusiastic – with 91% of science respondents calling the experience very or somewhat favorable. 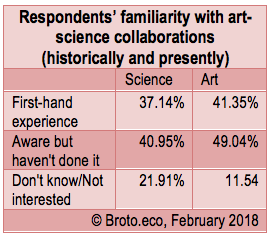 Asked the same question, artists with previous experience with one or more art-science collaborations were also enthusiastic, but less so – with 79% calling the experience very or somewhat favorable. This survey was conducted in February 2018 through online survey tools distributed to US and Canada. The margin of error is +/- 9%, 19 times out of 20. The closer the results are to absolutes (like 100% agreement) the lower the margin for error.